NAUGATUCK — The scene at Naugatuck High School last Monday was splendid. Every spring athlete enjoyed the near-perfect weather on the first full day of practice, which usually necessitates a jacket and a wool hat. Of course, not everything was picturesque. Those fields and that track the Greyhounds use are by no means the best around. But if this scene is fast forwarded to just three years down the road, everything — without exaggeration — will be perfect. That’s because in spring 2015, the Naugatuck athletic complex will finally be totally complete, according to the latest timeline of athletic director Tom Pompei. The $80.9 million renovation plan, which originally was set to last 36 months starting this November, will be accelerated to meet a 30-month deadline. That means Pompei will have to juggle the sports schedule with the construction schedule, as the school will remain open throughout. One of the first projects that will be tackled when construction begins this November is the new locker room facilities. The old locker rooms below the school will be abandoned in favor of new areas on the main floor. The first outdoor work will start in spring 2013 when the lower field — currently used for soccer and track — is torn up to allow the new, natural grass baseball and softball fields to be built. Both fields are set to have permanent fencing, press boxes, and scoreboards, and they will be able to use the existing lights. The downside of installing the new fields in spring 2013 is that they will not be able to host games in 2014, either, while the ground sets. That means the baseball and softball teams will play on their current fields in 2013 before moving to Rotary Field for the 2014 season. The only other sport that is scheduled to be directly affected by the construction timetable is track and field. The track will be ripped up in spring 2013, and the Greyhounds will have to travel for every meet that season. A new, eight-lane track will be laid around the artificial turf on the upper field, which should be completed by the end of summer 2013. If all goes according to schedule, the football and both soccer teams should be able to use the turf field in fall 2013. Additional grandstand seating on the visitors’ side of the upper field is also planned. The new track will afford Naugatuck High the opportunity to host Naugatuck Valley League and state events. 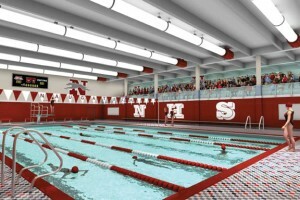 Also by the end of summer 2013, work on the two gymnasiums and natatorium should be finished. The main gym will undergo a basic refurbishment to replaced damaged and aged materials, while the auxiliary gym will be revamped to host to a rock climbing wall and zip lines. 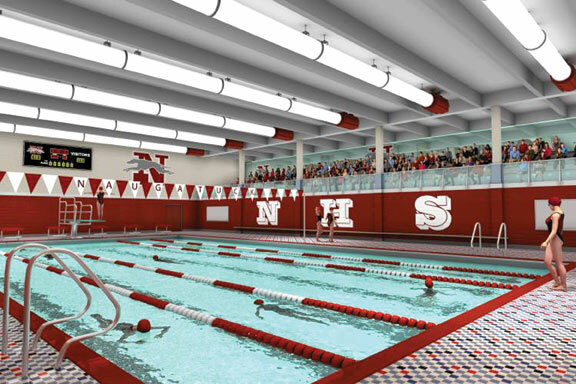 The natatorium will be restructured to comply with health and safety codes. Seating will be built lengthwise above the pool so spectators never touch the pool deck. Offices and locker rooms will occupy the space below the stands. The volleyball, basketball, and swim teams will hopefully experience little to no interference due to the construction and should be ready to use their new facilities by fall 2013, Pompei said. While the shuffling and juggling may seem like a lot to plan and digest, Pompei said, he has enjoyed every bit of the process so far. But the students aren’t the only ones chiming in with their ideas. Pompei said he’s consulted physical education teachers and coaches throughout the planning. Coaches have been appreciative of the opportunity to contribute directly. If all goes as planned, Pompei thinks borough residents — and anyone who comes to watch a game at Naugy High — are going to be dazzled.